New York City Mayor Bill de Blasio announced this past week that the city was ahead of schedule in reaching the goals of its 10-year affordable housing plan, Housing New York. The plan, which targeted the building or preservation of 220,000 units by 2024, is now set to reach that goal by 2022. 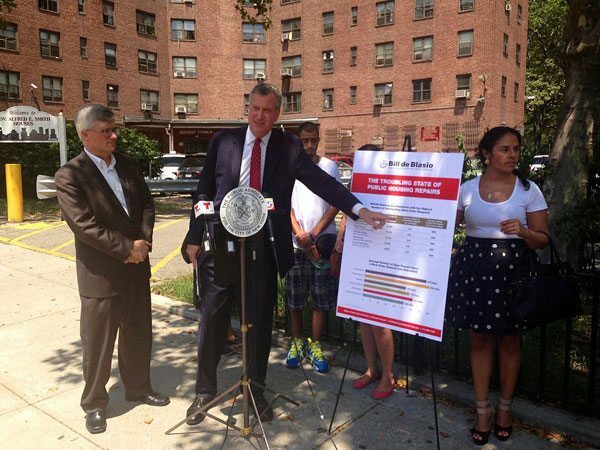 Given that success, de Blasio has added the goal of another 100,000 units on top of that by 2026. Mayor de Blasio used a mixture of incentives for private developers and creative zoning changes to enable these units to be built or preserved at rents that are below market rate. In his announcement this week, he shared that the city would invest in a fund to increase the role of nonprofit developers. Benjamin Dulchin, executive director of the Association for Neighborhood and Housing Development (ANHD), applauded this move, saying, “Nonprofits are mission-driven to make sure the neighborhood is getting the greatest benefit of the investment and the development.” ANHD recently released a white paper on the privatization of affordable housing development with respect to the de Blasio plan. According to this study, 74 percent of new affordable housing construction is done by private developers, who are primarily incentivized by bottom-line return made possible largely through tax breaks and market or above-market-rate pricing on non-affordable units in the same development. Nonprofit developers, ostensibly, would be focused primarily on the need the units are serving, not the financial return—a perspective that’s required over the next few years of the de Blasio plan. Right now, while affordable units have increased, there is a mismatch between the affordability of the units coming online and the need of residents. To date, the units that have been built or preserved as part of Housing New York have overserved low-income residents (at 51–80 percent of the Average Median Income) and significantly underserved extremely-low-income residents (at 0–30 percent AMI) in all boroughs except Staten Island.